As promised, we are back, and talking about your favorite subject – how to succeed in any business from a financial perspective. No one said this would be easy, but believe me, a bit of work, some discipline, and you will have financially less stress to deal with in your business. Here are some more suggestions for what you should put into the works in your business, as of yesterday. If you are not doing the following in your business, you are probably not going to meet your true potential and are doing yourself a disservice. You may be asking yourself, why should I budget? I know my business, and I know how to run it well. 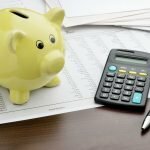 Why would I benefit from constructing a budget? Well the answer is not so simple, but in short, budgeting serves another purpose besides helping you plan for expenses. Budgeting helps you identify your history of expenses, which is more important than merely getting ready for expenses. Budgeting will give you a clearer picture of where you are spending and why, and as a leader, it behooves you to set aside a time for budgeting for your business’ success. see which months project to be profitable and when you may have a deficit, and why – this should help you visualize just how to increase your prices in anticipation of increases in your operating costs. That is great, I have sharpened my pencil and am ready to tackle a budget, but how do I go about creating a budget? Step 1: Log into everything that is tied in to your finances, such as banking, credit cards, loans, merchant processors, and so on, and export the financial data to an Excel (or comparable software) compatible worksheet. Bring all the data into one tab, and start by sorting the numerical data. Sort first by amount, to break out the cash out vs the cash in, then sort by vendor. Use the results to create summarized monthly data in line item format. Step 2: create a budget with line items, one for each category. Categories will mimic your profit and loss statement, so, for example, administrative expenses would include rent expense, office expenses, and so on. Step 3: create a budget based on 12 months, and start plopping in numbers based on prior year data. Step 4: forecast for changes in costs. You can easily use a multiple of the prior year, such as, multiply prior year cost by 102%, if that was the increase from the year prior to the previous year, (try saying that five times fast!) or, if you have the future expected costs available – you can use actual data. For example, you can contact your landlord ahead of time, and discuss with him or her the annual increase in rent expense. Taking this step ahead of time would open the door to negotiate the future rent increase ahead of time, hence allowing you to be better prepared. Many cost increases in one year are to be expected, and those business owners not increasing their prices in step with rising costs, or failing to identify and cut out inefficiencies and unnecessary expenses, can and will find their profits quickly shrinking over time. Step 5: start analyzing the data. Look for patterns and trends, see how much was unexpected, look for timing, explain decreases in costs, see where you can save, or what can be eliminated because it’s no longer needed, and so on. Step 6: make sure you plan for unexpected costs. Again, see last year’s numbers, and see exactly how much did that leak in the bathroom cost you…..or wow, you had a great year, how much was the increase in taxes again? You get the idea. Step 7: next, bring in your income figures, and see how much profit you are making on a month to month basis (income less expenses = profits), don’t forget to also adjust your income for your price increases. You can use a multiple here, or, if you know of expected projects that should yield specific revenues, by all means, use the more accurate info. Step 8: don’t forget to adjust cost drivers. An example of a cost driver would be merchant processor costs. As your revenues increase, the processing costs should increase as well. This is obviously much harder to predict, as most merchant processors have very complicated formulas they use to calculate their fees, consisting of a myriad levels and rates. Don’t waste your time trying to recalculate the fees, use this analysis as a way to learn how much they have increased last time, in terms of a flat rate, based on prior increases in revenues. Also, use this opportunity to perhaps look for other means of processing, maybe a competitor can offer better terms, or maybe you can use an alternative to credit card processing. In our practice, we have saved thousands of dollars by switching from conducting most business via convenient but very pricey bank-sponsored merchant processor, to utilizing a more competitive generic processor, and adding incredibly low priced ACH processing to the mix. Step 9: compare the budget to the actual results periodically, to see where you were on point, and where were the shortfalls. Learn from your results and investigations, look into the actual expenses, and see where you could have done better. 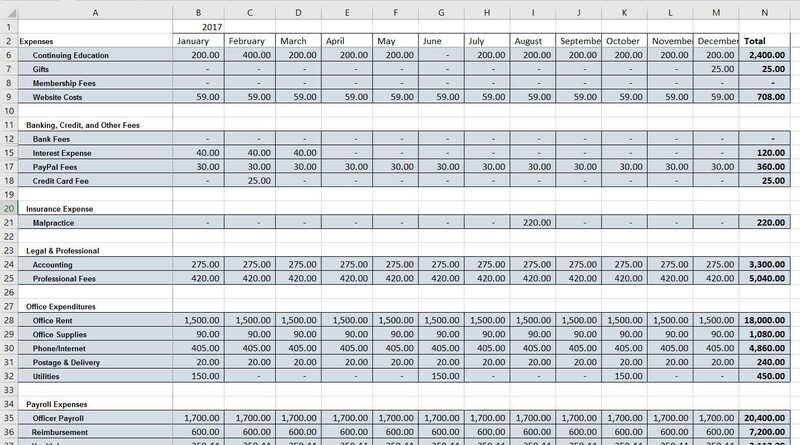 Step 10: update your budget monthly to reflect new data, and reuse the annual budget for the next year, as a template. 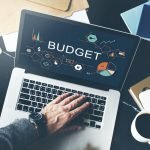 Can I short cut the pain of budget preparation? My accountant gives me a monthly profit and loss (P&L) statement, can’t I just use the prior year’s statements to analyze and prepare my budget? Not really. A budget, if constructed properly, will fulfill two functions: project taxable profits and help analyze cash flows. A budget should first be prepared in a profit and loss format to see the projected profits, and to use that as a means to project tax liability. This, however, will not help in projecting cash flows. Simply add non-P&L items that need to be paid. A very common example would be financing costs, like repayment of a loan. Remember, loan proceeds and subsequent loan repayments, are neither income nor expenses, and therefore they never land on a profit and loss statement. Money coming in when you take out a loan (debit cash – Asset, credit loan payable – Liability) are all balance sheet accounts, but they affect your cash flows and should be part of a budget. So, to answer your question, no, you need to study both, the profit and loss statement, as well as the balance sheet statement. Have you ever called in one of your vendors and requested to cancel your subscription for one reason or another? We went through something similar a couple of times, and guess what? To keep your business, they will typically turn around and offer a reduced price, or a summer promotion, discount or other ways to reduce your ongoing costs. This works nearly every time, with most vendors. Happy canceling! P.S. – That trick won’t work with us, so don’t even try! The pupil will not outperform the teacher in this one. Have you ever hired an overpriced domestic company for professional or other types of services? Now, I am a big proponent of keeping the work in-house, and in-country, to stimulate our own economy, etc., but, this blog is about saving money, and not politics. More and more, in our practice, we see many of our clients hiring abroad, whether they hired consultants, or entire companies. The point is that offshoring the expenses can get the job done at a fraction of the original cost, putting you ahead of the curve. Does your company pay for staff meals or outings frequently? This is not to say you should become a typical Scrooge and forget tipping the doorman each Christmas, no, by no means are we saying this. We are suggesting using the opportunity of reviewing your historical data, to see, could you have saved by spending less on expenses not critical to the company mission statement. Another idea is also to consolidate events to cut on duplicating costs. Perhaps have the Christmas and Chanukah party in the same event, just an idea. We have all been there, either at one side of the table, or the other. We are in business, and this is not a popularity contest like back in high school. Sorry folks, someone has to say this. A bad employee is worse than no employee at all. Bad employees can be the reason you’re losing business, or simply not “winning”. The costs of having employees can be quite high. Between recruiting, nurturing, liability, insurance, payroll taxes, and so on, the costs of having an employee quickly add up. When dealing with an incompetent employee, where you pick up the slack, don’t lose sight of the added cost of your own time spent to help cover for someone else’s shortcomings. To get ahead, you may simply need to make an employee’s position obsolete by introducing technology that can replace the employee, and make your operations more efficient. Review your operations from the ground up at least once a year, and re-analyze everything, including, should I keep that person or not? Typically, there is no greater cost than the human resources. Rene Descartes said it right, think therefore you are! Same goes with your budget, you need to rethink it to be aware if it is on track with what your original intentions for the budget were. If you do not rethink the expenses, over and over again, you will lose sight of them, and possibly miss opportunities to reduce or wipe them out altogether. Obviously, there are many ways to cut costs, so by now we hope you are getting the idea, and for those seasoned budgeters and penny pinchers, we hope to have given you some fresh insight, and some new ideas. In our next blog, we will continue to focus on how to succeed in any business, by speaking a little bit more about tax strategies to gain an advantage over your competitors. Stay tuned. Also, just wanted to take a quick moment to thank all our amazing patrons, we love to hear from you, and we will continue to develop interesting topics to help you stay informed and in the know. Please do not hesitate to reach us at any time to review your specific individual or business tax situation. We are always glad to help you. Posted in General, News & Press.